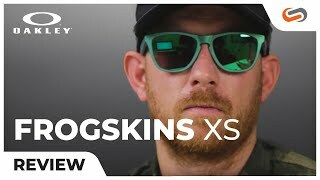 The Oakley Frogskins XS has all the amazing features of the original Frogskins sunglasses, except it is resized to fit the younger generation. The Frogskin XS sunglasses have the same iconic silhouette design and are constructed of Oakley’s durable O-Matter. As always, they feature Oakley’s 3 point fit system to provide optical precision. Get your prescription Frogskin XS sunglasses today at SportRx!